Copepods are small crustaceans found in the sea, nearly every freshwater habitat and even wet habitats on land like swamps, under leaves in wet forests, springs and puddles. Many species live on the sea floor whilst others are free swimming. Copepods (and krill) are thought to make up the largest biomass of any known species on the Earth. 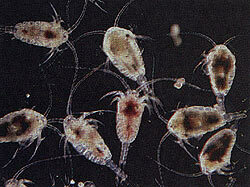 Copepods living as part of the plankton are very important to global ecology and the operation of the carbon cycle. In most marine food webs they are the most commonly occuring organisms and are eatenby a wide range of animals ranging from small fish, whales, seabirds to other crustaceans such as krill. The smaller Copepods are herbivores eating Phytoplanton, larger ones are carnivores. Almost half of the about 14,000 species of Copepods are external parasites living on fish, sharks, marine mammals, and many kinds of invertebrates such as molluscs, tunicates, or corals and, in freshwater, fish or invertebrates in fresh water. 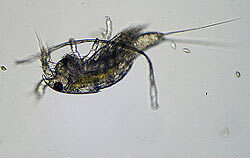 Most Copepods are between 1 to 2 millimetres length, with a teardrop shaped body and two pairs of antennae, one pair is large. They have an armoured exoskeleton which is almost totally transparent and one eye which is usually bright red andlocated in the centre of the head. They move using the second pair of antennae which beat like oars to pull them through the water. The first pair of thoracic appendages are modified for use in feeding. Because of their small size, copepods do not need of any heart, circulatory system or gills, they absorb oxygen from water directly into their bodies by diffusion. Are these copepods the hyenas of the sea? These copepods (small crustaceans) are members of the family Oncaeidae.